Author: Bernhardt, William Set In . . . Description: William Bernhardt’s powerful series of legal thrillers featuring crusading attorney Ben Kincaid have won him a die-hard following and widespread critical acclaim as a “master of the courtroom drama” (Library Journal). Now, on the heels of his national bestseller Criminal Intent, William Bernhardt returns with his most electrifying novel to date. Oklahoma attorney Ben Kincaid put his reputation on the line when he represented Ray Goldman. The seemingly mild-mannered industrial chemist was charged with a staggeringly brutal crime: the torture and massacre of an entire suburban Tulsa family. But in spite of the grisly, tabloid-ready details of the sensational case, Ben’s deft defense against a lack of hard evidence and improper police procedure made an acquittal all but certain. Until the prosecution’s star witness—the lone survivor of the slaughter—took the stand . . . and sealed Ray Goldman’s fate. Seven years later, Goldman’s date with the death chamber is at hand. But seconds before the lethal injection, an eleventh-hour reprieve halts the execution—and launches Ben on a race against time to overturn Ray Goldman’s conviction. Erin Faulkner, the young woman who narrowly escaped the carnage that claimed her family, has abruptly recanted her testimony, after years of silence desperate to keep an innocent man from dying. Just as suddenly, this near-miraculous turn of events turns tragic: Erin is discovered dead, an apparent suicide. And Ben Kincaid is the only witness to her stunning confession. Ben is certain Erin didn’t commit suicide. She was a victim of murder— silenced by the same killer who butchered her family. All Ben has to do is prove it. But his unseen enemy is determined to cover his tracks once and for all . . . with blood. 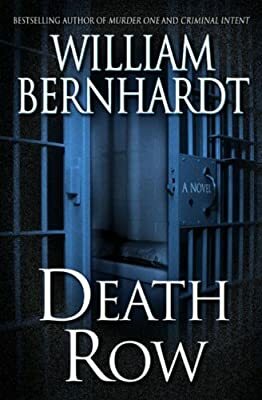 In Death Row, William Bernhardt ratchets up the suspense quotient to near-heartstopping new levels—and challenges even the most jaded thriller readers to keep up with the twists and turns. Crime will never pay. But crime fiction—served up with the wit, grit, and sheer virtuosity of Bernhardt—always pays off.